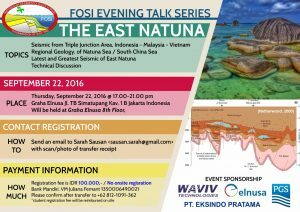 September Evening Discussion on the East Natuna Basin, sponsored by PGS, PT. Eksindo Pratama and Waviv. Supported by PT Elnusa Tbk. Limited space. IAS and SEPM members are welcome.